Over the Christmas holiday Hugh Hefner proposed to girlfriend Crystal Harris, a playmate I actually liked... and all I could wonder is how former girlfriend Holly Madison took the news. Yes, she seemingly moved on to a fabulous life in Vegas, but any fan of the Girl's Next Door franchise knows that Madison was poising herself to be Hefner's next wife... almost like it was her sole goal in life. Harris is a cutie pie and reminds me of Bridget, one of my favorites... so I'm hoping things work out for them. 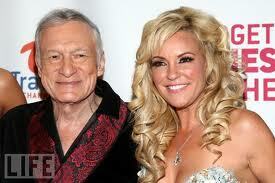 This is Hefner's 3rd marriage and he's like a million years old so it's not like he doesn't have some experience. I wish the engaged couple much success and marital bliss! Bridget vs. Crystal .... I think she could be a younger version of her. Thoughts?